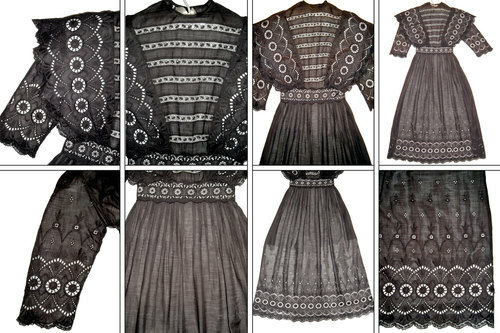 BEAUTIFUL & INTRICATELY DETAILED, HANDMADE VINTAGE VICTORIAN / EDWARDIAN, FINE COTTON LAWN /BATISTE LONG DRESS / GOWN DECORATED WITH ORNATE, GOTHIC FLORAL EMBROIDERY & CUTWORK DETAIL WITH SCALLOPED, FLORAL-PATTERNED LACE-TRIMMED EDGE - THIS ORNAMENTATION IS FOUND ON THE BODICE'S LARGE WING-LIKE "SHAWL" SHOULDER PANELS, ON THE THREE-QUARTER LENGTH SLEEVES, AND IN IT'S FULL 18" HIGH PATTERN AROUND THE ENTIRE PERIMETER OF THE SKIRT. BODICE FEATURES INSET HORIZONTAL FLORAL-PATTERNED LACE PANELS & FEATURES AN ORNATELY EMBROIDERED CUTWORK LACE WAISTBAND. GOWN IS FURTHER ACCENTED ON SKIRT FRONT & BACK WITH MULTIPLE PERFECTLY EXECUTED VERTICAL PLEATS. 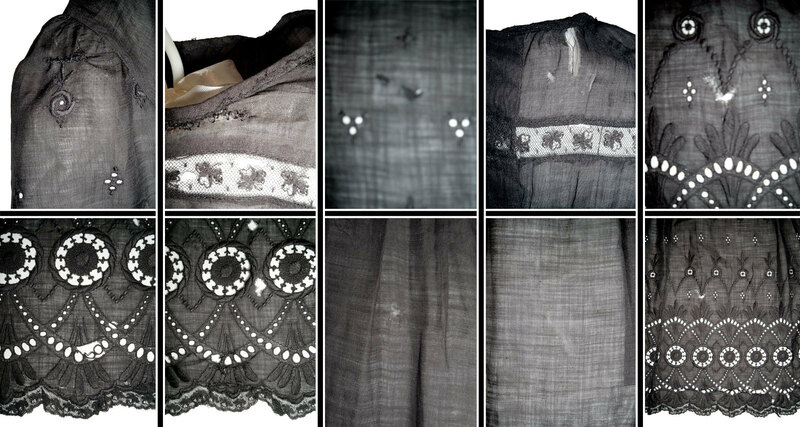 A BEAUTIFUL PIECE TO RESTORE, STUDY, DISPLAY OR SALVAGE FOR IT'S BEAUTIFUL ORNATE EMBROIDERY / CUTWORK DETAIL, LACE, & PLEATING DETAILED FINE COTTON LAWN BATISTE - A TREASURE TROVE OF MATERIALS FOR OTHER PROJECTS, BEING SOLD "AS IS". 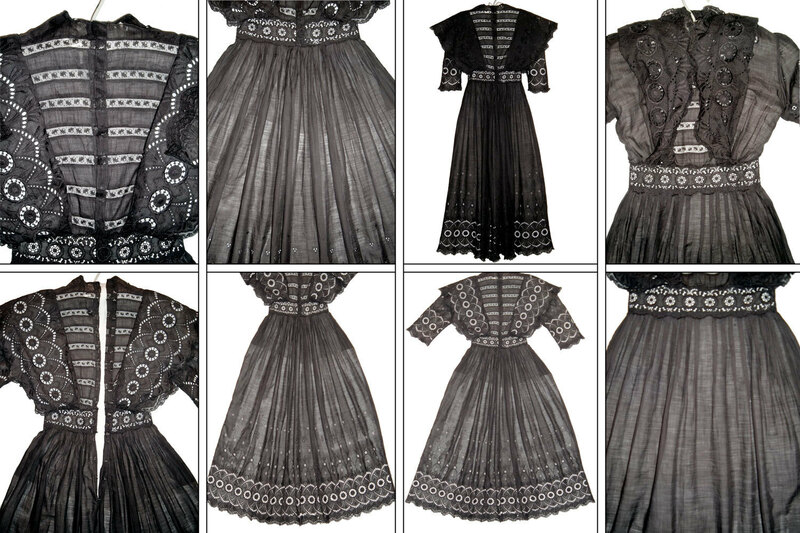 I'M NOT SURE IF THIS BEAUTIFUL GOWN WAS ORIGINALLY BLACK - POSSIBLY INTENDED AS A MOURNING GARMENT? - OR WAS ORIGINALLY WHITE & DYED BLACK. EITHER WAY, IT IS A GORGEOUS, DETAILED PIECE THAT WOULD HAVE BEEN INCREDIBLE IN IT'S ORIGINAL CONDITION, HOWEVER IT NOW HAS SOME HOLES IN THE INSET LACE PANELS, BREAKS IN THE CUTWORK - SEVERAL OF WHICH HAVE BEEN ADDRESSED WITH SMALL HAND REPAIRS, A COUPLE OF HOLES IN THE COTTON LAWN, ETC & IS BEING OFFERED "AS IS" FOR PATTERN, STUDY, DISPLAY OR SALVAGE OF THE BEAUTIFUL ORNATE EMBROIDERY / CUTWORK DETAIL, LACE, & PLEATING DETAILED FINE COTTON LAWN BATISTE, FLORAL PATTERNED LACE FOR OTHER PROJECTS SUCH AS DOLL CLOTHES. - A DETAILED DESCRIPTION OF THIS GOWN'S CONDITION WITH PHOTO REFERENCES CAN BE FOUND BELOW UNDER "CONDITION". MADE FROM A VERY FINE, THIN COTTON LAWN /BATISTE, THIS GOWN IS SOMEWHAT SHEER & WAS PROBABLY INTENDED TO BE WORN OVER A SLIP - THIS GOWN IS SHOWN HERE OVER A PLAIN WHITE DRESS TO BEST SHOW CUTWORK & LACE DETAIL. THE LONG WHITE DRESS IS NOT INCLUDED. THIS DRESS MEASURES APPROXIMATELY (MEASURED FLAT FROM SIDE TO SIDE, FASTENED AS SHOWN) BUST - 34" / WAIST - 23.5" / HIP - 48". SEE BELOW FOR MORE DETAILED MEASUREMENTS. THIS DRESS IS MADE FROM A BEAUTIFUL, WHISPER THIN COTTON - WHAT I BELIEVE IS CALLED LAWN OR BATISTE - IT IS SEMI-SHEER, VERY SOFT & BLACK IN COLOR. THIS DRESS IS UNLINED WAS PHOTOGRAPHED OVER A LONG PLAIN WHITE V-NECK DRESS (THAT IS NOT INCLUDED) TO BETTER SHOW DETAIL. 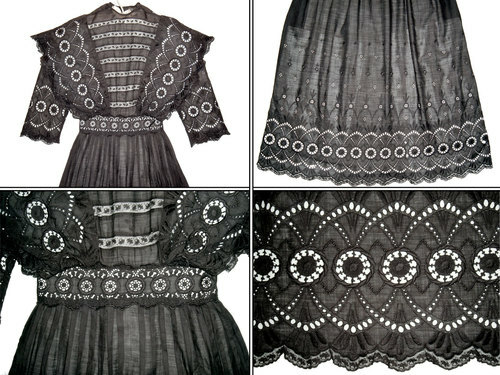 THE .5" HIGH INSET LACE AND .5" HIGH SCALLOPED-EDGE LACE MAY BE MACHINE MADE. 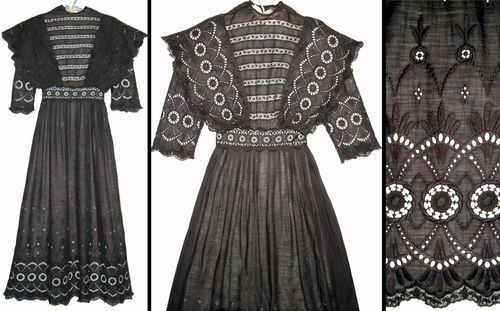 I'M NOT SURE WHAT THE LACE IS MADE FROM - ALL OF THE LACE IS THE SAME BLACK COLOR AS THE DRESS. SHOULDER: MEASURED FLAT FROM SHOULDER SEAM TO SHOULDER SEAM IS APPROXIMATELY 14"
THIS VINTAGE EDWARDIAN /VICTORIAN ERA DRESS HAS BEEN HAND-LAUNDERED, PRESSED & IS ODOR-FREE IN WHAT I WOULD DESCRIBE AS GOOD TO FAIR CONDITION FOR A PIECE OF THIS AGE - IT COULD POSSIBLY BE REPAIRED & WORN (ESPECIALLY IF YOU'RE MORE OF A "PUNK VINTAGE GIRL") OR WORN AS A COSTUME- BUT IT'S REAL VALUE MAY BE IN IT'S SALVAGEABLE MATERIALS - THE BEAUTIFUL EMBROIDERED CUTWORK /OPENWORK DETAIL WITH IT'S UNUSUAL GOTHIC FLORAL MOTIF, THE FLORAL-PATTERNED LACE, & SECTIONS OF MULTI-PLEATED FINE COTTON LAWN BATISTE COULD BE USED FOR OTHER PROJECTS OR STUDIED FOR THEIR AMAZING EXECUTION BY ANYONE INTERESTED IN SEWING OR FASHION DESIGN. I HAVE DONE MY BEST TO ACCURATELY DESCRIBE & PHOTOGRAPH THE CONDITION OF THIS VINTAGE EDWARDIAN /VICTORIAN DRESS. THIS IS A BEAUTIFUL VINTAGE TEXTILE PIECE, EXPERTLY DESIGNED & CONSTRUCTED WITH METICULOUS HAND DETAILING, FROM FINE MATERIALS, AN AUTHENTIC PIECE OF FASHION HISTORY THAT IS WELL OVER 100 YEARS OLD. IF YOU ARE LOOKING FOR A PERFECT CONDITION ITEM, THIS IS NOT FOR YOU. 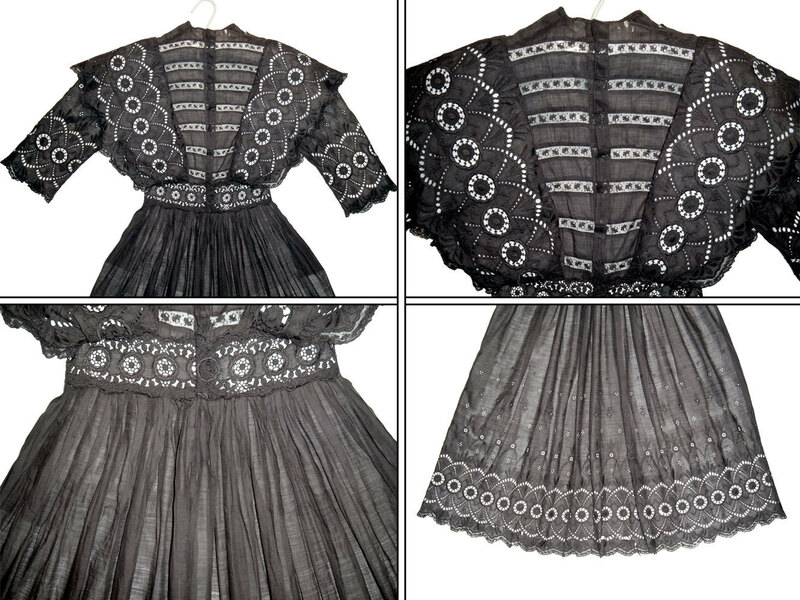 THIS BEAUTIFUL DETAILED BLACK EDWARDIAN/VICTORIAN ERA GOWN WITH ORNATE EMBROIDERY, CUTWORK & LACE INSETS IS BEING OFFERED AT A REASONABLE STARTING PRICE WITH NO RESERVE. SOLD "AS IS". PLEASE EMAIL ME WITH ANY & ALL QUESTIONS PRIOR TO BIDDING AS THERE ARE NO RETURNS ON VINTAGE ITEMS. ITEMS ARE BEING OFFERED FROM A NON-SMOKING, DANDER-FREE HOME! SOLD "AS IS"!